Introducing Macrobject Help Authoring Suite (HAS) 2012. Faster to run, easier to use. Many more features, much more value-for-money. 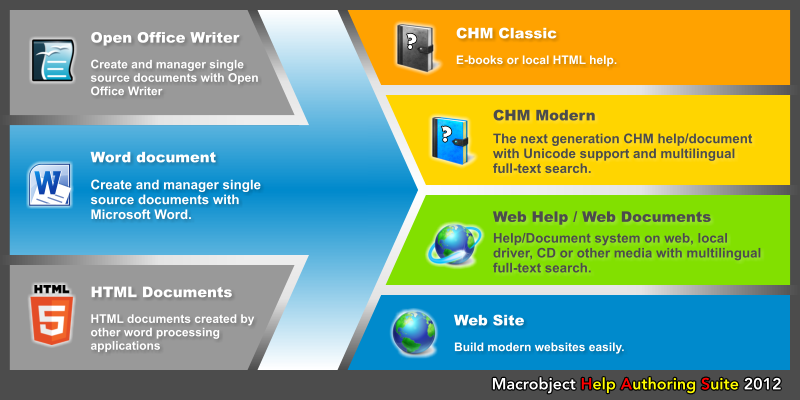 · Single Word document or other source input, multiple CHM and Web help outputs. · New CHM Modern option supports Unicode and multilingual documents. · Full-text multilingual document search in Web and CHM Modern helps. · Very friendly easy-to-use GUI and extremely fast execution times. · Simple re-usability via projects and flexible project templates. · Command line mode for batch process and build server applications. · Full control via settings, built-in add-ins, and your own customized add-ins. See Macrobject Help Authoring Suite 2012 product page for more information. You only need these 3 steps, to generate a fully professional help system. For more details, please refer to the online help and manual. Or download and try the complete Macrobject Help Authoring Suite 2012 for free. Trusted by the world's most recognized organizations and brands.